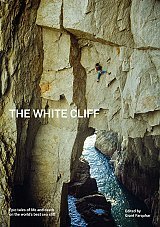 The White Cliff is an collection of writings about the best sea cliff in the world: Gogarth. This book has a historical narrative into which are embedded essays by various protagonists. The book is not just about the place, though. The climbers who have been drawn to touch the stone of Gogarth vhave often been the best of their generation and havevpioneered amazing routes elsewhere. The book is also about their personal stories of life and death. It details the history of the exploration of the cliff in the context of the time period, climbing standards and the development of equipment and techniques. In the process, it touches on a myriad of related issues. The chapters are structured by area. Most of the essays and images are previously unpublished but some have appeared before in books, magazines, or journals. Grant Farquhar has been climbing for over 35 years. Currently resident (and climbing) in Bermuda, he was highly active on Gogarth in the 90s and despite living faraway has retained his affection for the place. The book includes contributions from over 100 Gogarth pioneers including Martin Boysen, Joe Brown, Pete Crew, Henry Barber, Arnis Strapcans, Dave Durkan, Geoff Birtles, John Cleare, Leo Dickinson, Ed Drummond, Richard McHardy, Doug Scott, Smiler Cuthbertson, Mick Fowler, Pat Littlejohn, Ron Fawcett, Geoff Milburn, Jim Moran, John Redhead, Dave Towse, Glenda Huxter, Johnny Dawes, Paul Pritchard, Stevie Haston, Andy Pollitt, Steve Andrews, Twid Turner, Adam Wainwright, George Smith, Glenn Robbins, Tim Emmett, Neil Dickson, Jules Lines, Nick Bullock, Alex Mason, Emma Twyford, James McHaffie and Tom Livingstone.